weBoost Signal 4G Direct Connect 3G & 4G cellular amplifier for cellular modems. Includes Vehicle Cigarette Lighter (DC Power Port) Power Supply. Great for Vehicle's, etc. Part #460219 & 470219. 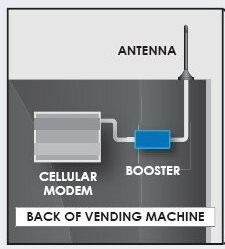 The Wilson Signal 4G was developed specifically for cellular modem applications in vending machines, remote monitoring stations and vehicles. It is based on the same field-tested, market-proven technology that powers cellular signal boosters for the consumer market. The Signal 4G is ready to integrate with cellular modems, Hotspots, MiFi devices & routers to provide reliable signal that ensures successful data transfer. This booster kit works with all US wireless service provider networks 4G Internet using 700 MHz AT&T, 700MHz Verizon, 1700 / 2100 MHz T-Mobile, 800 Mhz & 1900 MHz frequencies. The Signal 4G comes with a 3 foot RG-174 cable with SMA Male connectors on each end. It will connect directly to devices with SMA Female connectors. We also have a variety of external antenna adapters to connect to other external antenna port type. Hotspot & Router Antenna Adapters, USB Modem Adapters, Cable Connector Adapters & Converters. This amplifier was developed specifically for Machine to Machine (M2M) installations. It is based on the same field tested, market-proven technology that powers Wilson’s Sleek (weBoost Drive S) in-vehicle cell phone signal booster for the consumer market. The Signal 4G’s small size makes it an ideal for vending machines, remote monitoring stations, vehicles or other installations with little room. It can be paired with a variety of expertly designed Wilson Electronics cellular antennas for maximum system gain to overcome a weak signal. The Signal 4G is FCC certified to the latest technical standards for cellular signal boosters. 3ft RG-174 Cable with SMA Male connectors on each end. Integrators and OEMs can pair the Signal 4G with a variety of expertly designed for maximum system gain to overcome a weak signal. It also incorporates power control logic that ensures maximum output power is within cellular network standards and will not interfere with a cellular network.